Hires. These are people who were hired within the past 30 days. Open positions. These are positions for which employers is advertising (actively recruiting) and could be filled within 30 days. Open positions filled by someone the employer already knew. These are employee referrals, leads generated from networking, etc. A review of the BLS data shows that hires always exceed open positions. That means that many of the people who were hired filled positions which were never advertised to the public. A review of the 2009-10 JOLTS data by Jobfully showed that number to be 40 percent. Taking into account the number of jobs that were filled by someone known to the employer and the percentage of unadvertised jobs (jobs found through networking) becomes 70 percent. So where does my 80 percent figure come from? The data used by Jobfully is now several years old and over those three years it has become increasingly easy for employers to promote their job openings without paying to advertise them. Many but not most employers are promoting their jobs on social media. 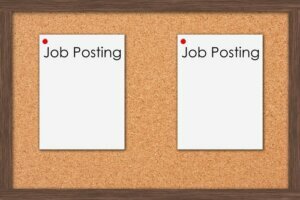 Jobs posted to Facebook, Twitter, LinkedIn, etc. when filled fall into that third category of open positions filled by someone the employer already knew. In addition, there’s been a significant increase in the number and effectiveness of employee referral programs. I believe that the increased use of social media and employee referral programs over the past few years has increased the percentage of unadvertised jobs from 70 to 80 percent.